Next Business Day Guaranteed Response Time. If you have a question or problem with your website, email, or SIMS Editor, you may contact us directly from your Administration Interface. You may also search the Knowledge Base to see if the issue you are experiencing has already been reported and remedied, or to see if it is a known issue. 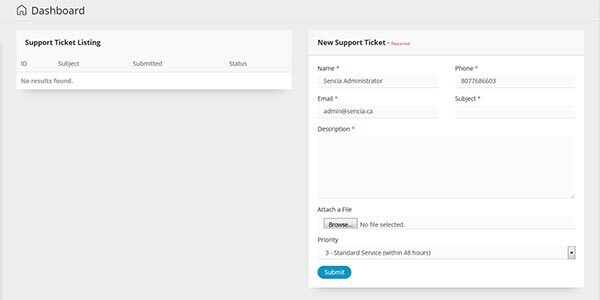 Support Tickets can be filled out by logging into the SIMS administration area. The support page is located on the main dashboard upon logging in. Alternatively, you can reach it by selecting the Support tab under the Admin Menu on the left. In the Support Ticket area, enter your Name, E-Mail Address, and Telephone Number in the fields supplied. By default, the information your SIMS account was registered with will be filled in this area to make this step easier. Enter a Subject for the Support Ticket. Try to keep the subject brief and concise. You can expand on your subject in the description field. Choose a priority for the Support Ticket. If your problem is URGENT, set your priority level to HIGH. In all other cases, leave the ticket priority at LOW. Optionally you may wish to include a file or screenshot of your issue in the Attach a File field. Click the Submit button to generate your support ticket. A Sencia Support Team Representative will be in touch with you as soon as possible to respond to your query. HIGH priority support tickets during off hours may result in a fee. Do you have an idea that can help make the SIMS Manual even better? we'd love to hear your ideas and opinions.